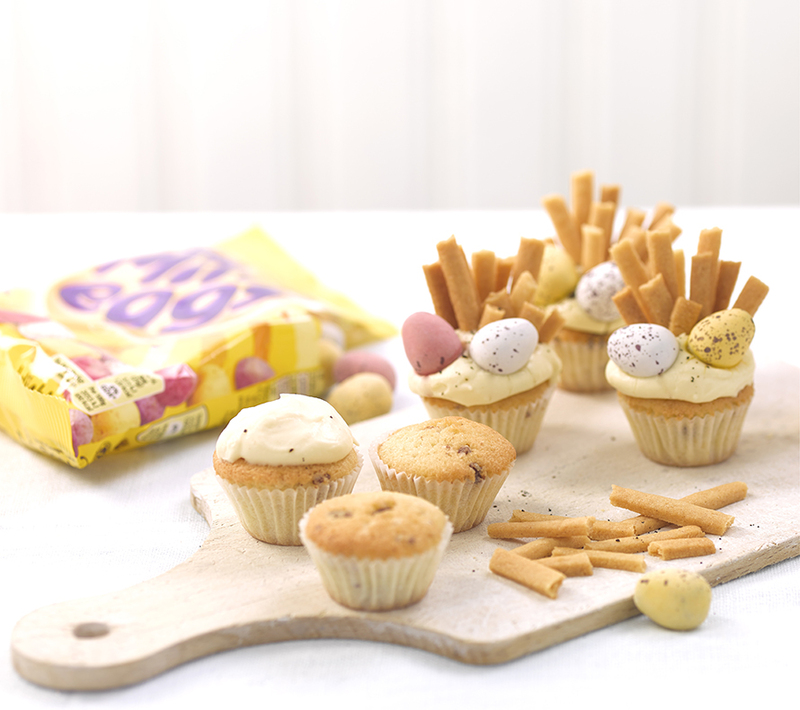 My Mini Egg and Chip cupcakes were created for Cadbury using their much loved mini eggs. Taking inspiration from my mini fish and chip cakes I swapped biscuit fish for mini eggs and assembled sweet miniature versions of the popular dish. The cupcakes themselves are a simple vanilla sponge with smashed up mini eggs folded through the mixture. Normally getting egg shell in your cakes is a disaster but with these bakes it’s a bonus and adds an extra mini egg hit and choc chip effect to the sponge. Chips can also be found via the vanilla biscuits which produce a decorative touch and textural crunch to the cakes. Both the mini eggs and chips are sat on a dollop of my version of sweet mayonnaise, which is basically creme patisserie enriched with whipped double cream. A final grind of vanilla seeds adds to the bakes vanilla hit while looking not unlike ground black pepper. Any extra biscuit chips are great dipped into any of the left over sweet mayonnaise and both look great served up in egg cups. Equally the mini cupcakes can be displayed and transported in empty egg boxes. Pre-heat the oven to 170C, 150c Fan, Gas Mark 3. 1. Whisk the egg yolks, vanilla extract, sugar and flour together in a large bowl until pale and slightly thickened. 2. Heat the milk in a large saucepan pan and bring to the boil. 3. Remove from the heat and pour 1/3 of the milk into the mixture in the bowl and whisk together. 4. Pour this mixture back into the pan with the rest of the milk and return to a medium heat, stirring continuously with your whisk. 5. Once the mixture has thickened remove from the heat and pour into a clean bowl or wipe clean the one you were using with some kitchen towel. 6. Cover the surface of the mixture with some cling film and leave to cool. 1. Cream together the butter and sugar, then gradually beat in the egg and vanilla extract. 2. Sift and stir in the flour and mix to a fairly soft dough. 3. Turn onto a lightly floured surface and knead gently. 4. Cover or wrap the dough in cling film and chill for at least an hour or preferably overnight. 5. When ready, roll the dough out on a lightly floured surface to a few mm thick. 6. Cut into strips approx 3-5mm in width with a knife or pizza cutter. 7. Transfer the biscuits on to a baking tray lined with baking parchment and bake in the oven for approx 5 minutes until the biscuits edges turn lightly golden in colour. 8. Once out of the oven leave the biscuit chips on the baking tray to cool. 9. When cool break the strips into chips approx 3cm in length. Don’t worry about being too exact as you are looking for chips in varying sizes! 1. Line a 24 deep hole mini muffin/cupcake pan with 24 mini cupcake cases. 2. Place 10 mini eggs in a sandwich bag wrapped in a teacloth and smash into bits using a rolling pin, set aside. 3. Beat the butter, sugar and vanilla extract into a bowl to a lightly creamy consistency. 4. Slowly beat in the eggs, one at a time. Sift and fold in the flour and then stir through the broken up mini egg pieces. 5. Divide the mixture into the cases and bake for approx 5-10 minutes until light golden brown and a knife inserted into the centre of the cakes comes out clean. 6. Set aside to cool. 1. Whip the double cream to thick peaks and softly beat the cooled creme patissierie. 2. Fold through the cream till smooth. Spoon or pipe on to the top of each cupcake. Insert some biscuit chips followed by 2 mini eggs and a grind of vanilla seeds if using.